There we were in a van filled with four kids, my sister, and her boyfriend. 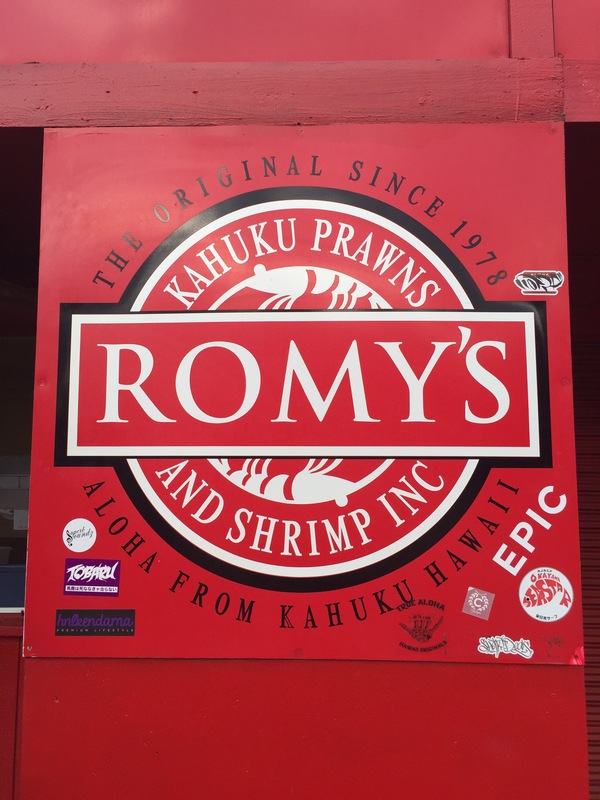 We were on a mission to find some garlicky shrimp that would soon end our hunger and satisfy our taste buds. That’s what my family and I just did. On a beautiful day like this, it only made sense to indulge in yet another adventure with the sun shining down on us surrounded by the bluest clear sky. The drive to this shrimp shack is one of the most beautiful drives I’ve ever been on. 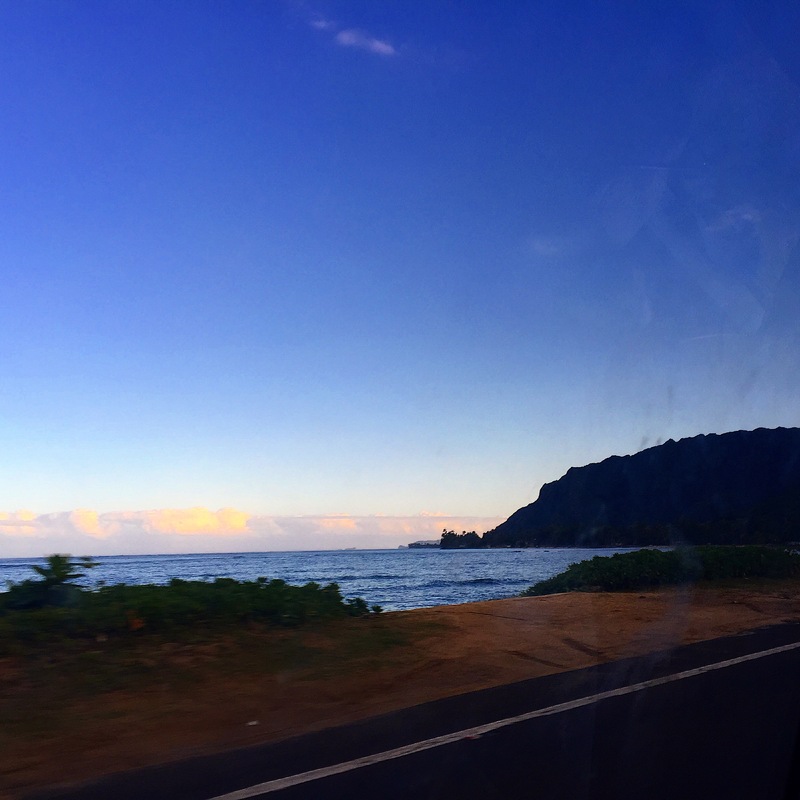 You’re on a road surrounded by Palm trees, tropical flowers, hills that were covered with bright green grass, and the shimmering ocean waving at you as you drive by. The further you drive you find little stops that will lead you to fruit stands filled with bananas, mangoes, coconuts, and papayas. In the horizon, you’ll see tiny houses surrounded by fences which gives the area a rustic feel. Within these fences you’ll hear cows mooing in the distance. Once you pass these farmlands you’ll find yourself driving by a lush field full of pineapples as the breeze catches your hair. Trying to stop my hair from flying I caught a glimpse of my nephews in the back seat silently asleep on each other’s shoulders. Sitting next to me on my left is my niece who tries to teach me how to play sing along patty cake. I must say I almost got the hang of it until the sight of wind turbines caught my attention to my right. I suddenly felt an emotion that would soon remind me of my past. A hidden history so far away and yet so close. A memory that brings me joy and makes my heart ache at the same time. These turbines are a symbol of a dear friend I lost about four years ago. We would go on these spontaneous adventures around the Columbia River Gorge and get lost in the mountains. We’d go on hikes and follow the peaceful music of water running in between rocks, which led us to ice cold steams or waterfalls. Sometimes we would go so far up the mountain we’d stumble upon snow. This was the best part because without fail, we’d get stuck for hours trying to figure out how to drive out of this one. I knew that no matter where I was, I’d be okay. I’d be more than just okay, I’d be safe. Hans was always prepared for whatever obstacle we’d encounter and he dove in head on. My favorite memory was how we’d go high enough that I would roll my windows down, have the chill wind blowing in my face, turn to look at him with the biggest smile on my face and say, “look Hans I can touch the clouds!” Then we would both giggle. Moments like this reminded me that all things were possible. Hans and I shared many adventures. He taught me to never loose myself, but to get lost in the journey. To keep an open mind, to go where ever my heart desires, and to never be scared to follow an unknown path. He showed me to embrace the world for what it was and to appreciate nature. Since then, I’ve been letting the adventure continue. Soon enough you’ll see a long line full of people trying to order shrimp to their likings. 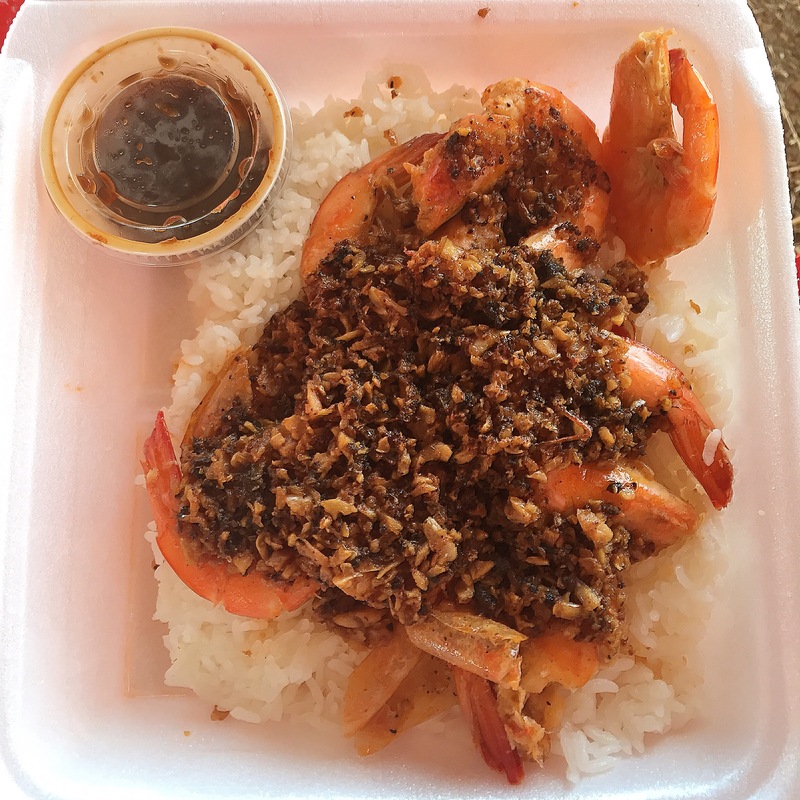 I must suggest that thirty minutes before you arrive to the shrimp shack to call in and place your order or you will be waiting at least thirty to foury minutes to put your hands on these mouth watering shrimp. The cool breeze will take the heat off your face. The air is filled with the aroma of garlic and shrimp, mixed with the scent of grass. Music will be heard from the shack and to the right of it there will be a little water pump guzzling away. Across the street is a farm that sells pizza, sandwiches, and ice cream. If you like, they also offer farm tours. After a while you’ll hear your name being called in the distance in the middle of cars driving by. Our excitement started to increase as we all got up and quickly washed our hands in the sink provided for us. You’ll get a styrofoam box filled with rice, garlic, and succulent shrimp with the shells and head still in tacked. My family does it the traditional Filipino way and dig in with our hands. All of us sitting there silently pulling the heads off and sucking off the garlicky buttery goodness. These shrimp literally melt in your mouth. Satisfied, we all got up and washed our hands off what would smell of garlic and shrimp for the rest of the night. 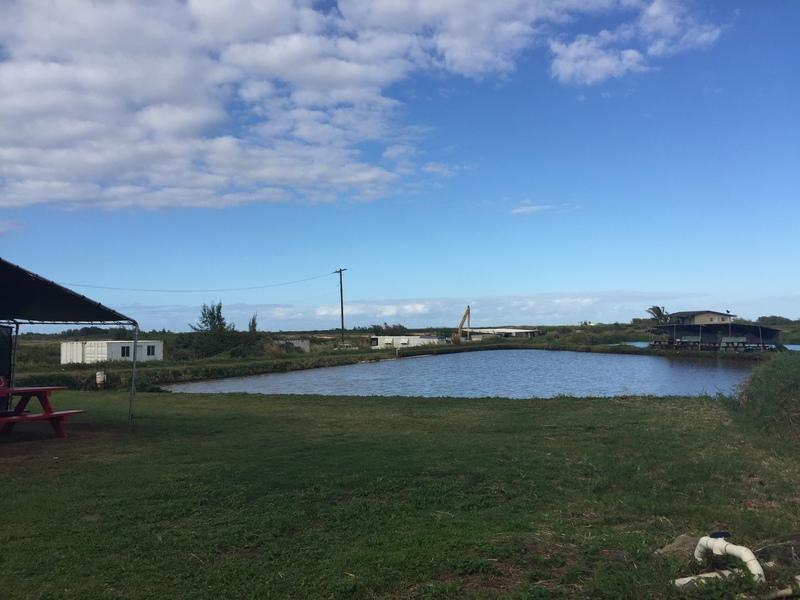 We throw our trash away and continue on our adventure around the island. At this point the sun started to set, the colors of orange and purple quickly started to fill the sky. The kids falling asleep to the music playing in the van and me wondering when the next time I’ll be able to eat these shrimp again. I’ve been reading up on your blogs & they’re simply fantastic. Love the attention to detail & the heartfelt emotions that clearly shine through. Your ability to describe places makes it all come alive ! Thank you so much for following my post. There will be so much more to read about in as 2016 goes on. Happy New Year!